Senior living community allows lifelong security. Anne Connors spent 40 years teaching high school, then dedicated another eight years to tutoring students who needed extra help. She loved her work, but was happy to finally retire. To help manage her retirement well into the future, Anne decided to move into a continuing care retirement community. “I have no children,” shares the Upstate New York native. “I have family, but most of them are up North. I’m in excellent health now, thank God, but if anything were to happen to me, my family would have to come in from out-of-town and make decisions without knowing what facilities down here are like. The community Anne chose was Concordia Village of Tampa, which is the former St. Joseph’s John Knox Village. Concordia Village of Tampa’s continuing care community includes independent living, assisted living, memory care, long-term nursing care and short-term rehabilitation. A huge benefit of living at Concordia Village of Tampa is it takes away the stress of home ownership, points out Anne. She likes that she doesn’t have to worry about taking care of property, especially in the event of a hurricane or if the house needs a new roof. In addition to feeling secure, Anne also feels comfortable at Concordia Village of Tampa. She appreciates the opportunities to mingle and enjoys the camaraderie with other residents. “I absolutely love the people here,” she relates. “I’ve met the most inspirational people, including World War II Veterans. I interact with people who’ve suffered great loss and great sorrow, but still smile. These people have aged gracefully. They’ve made the most of life, and they are fun to be around. Concordia Village of Tampa is a wonderful place to meet people. “There are so many activities here that when I say I’m retired, I laugh because I never have time. There are speakers that come in and classes that are available every week. There are a variety of trips planned. When it comes to retirement living, there are many factors seniors must consider before deciding which community is right for them. One factor is their future needs. As a continuing care community, Concordia Village of Tampa provides the broad network of services that allows seniors to age in place while remaining as independent as possible. Concordia Village of Tampa is part of Concordia Lutheran Ministries, a place for caring and healing for more than 135 years. Concordia Lutheran Ministries, based out of Western Pennsylvania, began as an orphanage and now offers senior living communities across Western Pennsylvania and Ohio. The community in Tampa is their first venture into Florida. Lisa agrees with Anne that when people move into Concordia Village of Tampa, they’re getting security, both financial and physical. The campus itself is a secure, gated community with security guards always on duty. The community also has nurses and certified nursing assistants on staff 24/7 to provide health assistance if residents should have medical issues. When residents choose to move into Concordia Village of Tampa, they are able to bring in their own furniture to make their apartments feel just like home. Concordia Village of Tampa has many amenities for its residents’ comfort and enjoyment. There’s a beautiful swimming pool, a fitness center, a spa with a Jacuzzi®, a beauty shop, a credit union, a computer lab and a movie theater. “We offer exercise classes five days a week,” says Lisa. “We also have water aerobics and Tai Chi classes. We have a lovely chapel, and all faiths hold services there. In addition, we have a woodworking shop and two wonderful libraries. Concordia Village of Tampa is located in the heart of Tampa Bay’s vibrant university neighborhood. It’s situated close to shopping, restaurants, health care and attractions. Anne likes the convenience of the community’s location, but that’s not what she likes best about living there. 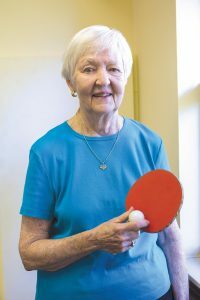 With all of the activities available at Concordia Village of Tampa, Anne keeps herself very busy. Still, she didn’t give up all of the important things that were part of her life before she moved into her independent living apartment. “I’ve kept up all of my friends, activities and volunteering out in the community,” she explains. “I still do all of that in addition to being very involved in volunteering here and in our Residents’ Association. I do all sorts of things here that are worthwhile and contribute to helping others. “I think I’m the smartest person on the face of the earth for making the decision to move into Concordia Village of Tampa when I did,” Anne enthuses. “The older people get, the harder it is to move and the more tiring it is. I did it a little bit sooner than I thought because they had an apartment available that suited my needs.